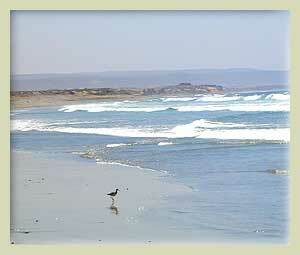 Welcome to Playa del Socorro, San Quintin’s prime beach front property facing the Pacific Ocean and next to the Transpeninsular Highway, in sunny Baja California. Whether you dream of an ideal summer home, the perfect retirement location or simply enjoying the best of what Mexico can offer, you can now own a piece of heaven in the beauty and isolation of Playa del Socorro, for a fraction of the cost of a house in the U.S. Here in Playa del Socorro you will find prime real estate, next to a virgin beach, untouched by mega developments, with its magnificent ocean vistas, panoramic sunsets and above all tranquility. Your retirement dream home can now become reality in the beauty and isolation of Playa del Socorro.
" I bought my home al Playa del Socorro for it's safety, security and Mexican flavor. Besides, I also get a chance to go lobster diving once in a while and great surfing ".